On Thursday, I joined Edmonton-based social media consultant and digital strategist Walter Schwabe on “Gov 2.0 TV” to talk about what’s new in open government since our last interview. 2011 Gov 2.0 year in review: What Gov 2.0 issue mattered most in 2011? Disruption caused by an increasingly mobile and networked society certainly ranked high. Other key developments included a new Open Government Partnership, emerging civic media, open source adoption, new civic startups, the growth of open data, and fights over intellectual property and Internet freedom. The Week the Web changed Washington: Collective action halted SOPA and PIPA. Now we’re in unexplored territory. “The President of the United States is on the phone. Would you like to Hangout on Google+?”: Can a Google+ Hangout bring the president closer to the citizens he serves? More notable criticism of the Stop Online Piracy Act (SOPA) in the U.S. House of Representatives and the PROTECT IP Act in the U.S. Senate went online this weekend. Tim O’Reilly made his case for why SOPA and PIPA are bad industrial policy this weekend. The EFF explained how SOPA and PIPA violate White House principles supporting free speech. The MIT Media Lab came out against the bills with a lucid post by Joi Ito and Ethan Zuckerman explaining why they oppose SOPA and PIPA. And, despite the paucity of coverage on the TV networks whose parent companies helped write the bills, a prominent blog post on SOPA and PIPA at Craiglist will continue to raise awareness online. The most intense day of online protest looks yet to come: On Wednesday, many websites will “blackout” to protest these bills, including Reddit. The biggest of these to date is Wikipedia’s SOPA initiative: co-founder Jimmy Wales shared on Twitter that Wikipedia will be “blacked out on Wednesday. For those left wondering why such opposition persists after some sensational headlines this morning, prospects for the Stop Online Piracy Act in the House are significantly damaged but the legislation is not “dead.” Rather, the legislation is shelved until ‘consensus is reached.’ I believe that the writer at the Examiner sourced Rep. Darrell Issa’s statement from late Friday night when he wrote that Rep. Cantor made a ‘surprise statement.’ There’s no such statement in the House Majority Leader’s social media accounts or at GOPLeader.gov. As of this afternoon, requests for a statement to Rep. Cantor’s office have not been returned. Here’s what actually was released: “Majority Leader Cantor has assured me that we will continue to work to address outstanding concerns and work to build consensus prior to any anti-piracy legislation coming before the House for a vote,” said Rep. Issa in a prepared statement released late Friday night. It appears SOPA is headed for the shelf due to the rising tide of opposition. Details on the site where I do my day job, CSOonline. I also wrote a post warning people that this isn’t over by a long shot. “My Administration will not authorize the indefinite military detention without trial of American citizens,” wrote President Obama in a signing statement. It’s the actions of presidential administrations in the future, given detention powers in the NDAA, that worry many observers, including the ACLU. Once such executive authority is granted, it will likely take years for the judicial system to provide a check or balance. And given that the Immigrations and Customs Enforcement division of the Department of Homeland Security has already been taking down websites for over a year, caution for this White House’s position here is warranted. In one scenario, consider that a heavily amended version of SOPA and PIPA that do contain DNS provisions could make it through Congress, once “consensus is reached” in the House and a filibuster from Senator Wyden in the Senate is overcome. In the absence of clearer guidance from the House Majority Leader’s office on what’s acceptable in the bill, it remains possible that a deal could still be made which legislative leaders then feel represents “consensus” — Rep. Smith has said he’ll pull the DNS provisions, for instance — and then SOPA could be brought to a vote. The President could add a signing statement and, well, you get the idea. Chairman Smith: “To enact legislation that protects consumers, businesses and jobs from foreign thieves who steal America’s intellectual property, we will continue to bring together industry representatives and Members to find ways to combat online piracy. “Due to the Republican and Democratic retreats taking place over the next two weeks, markup of the Stop Online Piracy Act is expected to resume in February. He’s right. These bills would upend the predictable legal environment created by the Digital Millennium Copyright Act, subjecting online innovators to a new era of uncertainty and risk. Legal experts from the top law schools in the country warn that they would damage free speech. Human rights experts warn that they would would force pervasive scrutiny and surveillance of Internet users’ online activities. Venture capitalists warn would chill the growth of social media and conscript every online platform into a new role as content police. The government’s own cybersecurity experts, at Sandia Labs, warn that these bills would damage DNSSEC, harming national security at a time when American government, businesses and consumers face attacks on their networks and computers every day. The founders of the Internet and World Wide Web warn that would lay the groundwork for an increasingly balkanized Internet, directly undercutting U.S. foreign policy advocacy in support of a single, global, open network. While Wikipedia and other sites blacking out at this scale is an an unprecedented action, what happens offline is still critical. That’s where laws are still made, after all. While new means of collective action enabled by the Internet are increasingly important, particularly with respect to generating coverage of these bills by the broadcast media, the voices that Representatives and Senators listen to most are those of their constituents. If these bills are important to you, the most effective action that any concerned citizen that wants to talk to Congress can take remains to go see your Senator or Congressman in person, call them or write them a letter. The Friday night news dump lives on: at 12:30 AM last night, I received an email from the U.S. House Committee on Oversight and Government Reform: according to the release, Rep. Lamar Smith said he will remove the domain name provision from the Stop Online Piracy Act. Rep. Darrell Issa says he’ll suspend next week’s hearing with Reddit co-founder Alexis Ohanian & other Internet experts. As you may have heard, the United States Congress is considering anti-piracy bills that could cripple Internet industries that are engine of the dynamic economic growth all around the world: the Stop Online Piracy Act (SOPA) in the U.S. House of Representatives and the PROTECT IP Act in the U.S. Senate. House Oversight and Government Reform Committee Chairman Darrell Issa today announced that a hearing scheduled for Wednesday, which was to examine the impact of Domain Name Service (DNS) and search engine blocking on the Internet, has been postponed following assurances that anti-piracy legislation will not move to the House floor this Congress without a consensus. This isn’t the end of the news, however: on the same night, this morning, the White House responded to the “We The People” epetition asking the President to veto the Stop Online Piracy Act & PROTECT IP Act. Cybersecurity coordinator Howard Schmidt, US CTO Aneesh Chopra and OMB intellectual property enforcement coordinator Victoria Espinel wrote it. While they don’t address the veto requested in the epetition, the White House did come out strongly against the DNS provisions in the bills. Taken in context with Senator Leahy’s statement on reconsidering DNS (albeit not removing it from the bill) and Rep. Lamar Smith saying he’ll remove a DNS provision from SOPA, one of the major concerns that the tech community appears to have been heard and validated. Read my past coverage of SOPA and PIPA at Radar for these concerns, including links to the bills and a white paper from Internet engineers. The White House, however, did write that “existing tools are not strong enough” and that they want legislation to move forward. That could well be the OPEN Act supported by Senator Ron Wyden and Rep. Darrell Issa. also worked for the MPAA. 1) The technical concerns of the Internet community appear to have been heard. It’s also likely that the federal government’s own cybersecurity experts, including Sandia Labs and Schmidt himself, influenced Congressional actions here. Senator Leahy, however, has not committed to remove DNS provisions entirely from PIPA, only to research them upon passage. That’s likely to be unsatisfactory to many concerned with the bills. “Trust us” to study it after passage is a tough sell. 2) The White House is supporting the arguments that online piracy is a a “real problem that harms the American economy, and threatens jobs for significant numbers of middle class workers.” That statement should have been supported with more evidence from the government’s research institutions. 3) The response from the White House has to be considered an open government win, with respect to an epetition resulting in a statement from the top IT officials in the country. That said, posting it on a Friday night Saturday morning, as opposed to a response from the President during his Friday news conference, buried* diminished the impact of the news and muted its political impact. 4) Most American citizens oppose government involvement in blocking access to content online, particularly when the word “censor” is accurately applied. When asked if ISPs, social media sites and search engines should block access — as they would under SOPA — only a third of Americans agree. It will be up to the American people to hold them accountable for the commitment. This pretty clearly pits the Obama Administration against SOPA/PIPA. It also calls for more open and honest discussion about these bills and the problems they seek to address. Since there has been almost no discussion or debate until very recently on the legislation in question, this is a very welcome development. I admit that while I’m pretty glad to see the administration come out with this sort of in-depth statement on the matter, I have a hard time trusting the president on these issues. His veto pen notably did not come out to quash the NDAA – a bill he vowed at one point to not let past his desk. Then again, internet regulations may have wide, bipartisan support but still nowhere near the support that a defense funding bill has. Obama may have seen a political fight he couldn’t win, read the writing on the wall, and backed off of the NDAA rather than suffer a blow right before an election. The same does not apply to SOPA/PIPA. So an executive veto on these bills seems much more likely, though at this point – with various congressmen starting to speak out, lots of companies threatening blackouts of their websites – including Wikipedia and Reddit – we may see the momentum behind these bills grind to a halt. The White House statement on the matter will only help push the conversation in congress. That’s a good thing. It increasingly looks like the SOPA/Protect IP fights are turning into an example of how the political system sometimes does work correctly after all. The con forces on these bills initially looked numerically overwhelmed in congress and hugely outspent. But opponents really mobilized vocally, got people and institutions who don’t normally focus on politics to write about this, and perhaps most important of all demonstrated that more people genuinely cared about this issue than most members of congress initially realized. Now the momentum has slowed incredibly and the White House technology policy team has come out against these bills. Without the DNS provision, SOPA now looks a great deal more like the OPEN Act, a bill introduced by Rep. Darrell Issa (R-Calif.) and Sen. Ron Wyden (D-Ore.), which was designed to be an alternative to SOPA. A watered-down SOPA means Smith improves his chances of getting the bill through Congress but at this point, nothing is assured. Leahy issued a statement which appears to be a reply to the request by those senators. He argued that the PIPA vote should go ahead as planned. It sounds as if Leahy is trying to keep some of the bill’s supporters from bolting. There’s little question now that some SOPA and PIPA backers in Congress are in retreat and seeking some kind of compromise in the face of significant opposition. After repeatedly insisting that establishing a national censoring firewall with DNS-blocking was critical to the Stop Online Piracy Act, the bill’s sponsor (and chair of the House Judicial Committee) Rep Lamar Smith has blinked. He’s agreed to cut DNS-blocking from the bill, in the face of a threat from rival Rep Darrell Issa, whose House Oversight and Government Reform Committee was preparing to hear expert testimony on the harm that this provision would do to national security and the Internet’s robustness against fraud and worse. Even without its DNS provisions, SOPA remains terminally flawed, creating a regime that would be terminally hostile to any site that contains links and any site that allows the public to post comments on it. But attention has shifted to PIPA, the Senate version of the bill, which is nearly as bad, and which is rocketing towards an imminent vote. Combine all those concerns, and the statement is a fairly sweeping condemnation of SOPA and PIPA in their current form. Espinel and her colleagues appear to have left enough wiggle room in the statement to allow the president to sign a future version of the bill that addresses some, but not all, of the critics’ concerns. But the bill’s sponsors are now going to have to work hard to satisfy critics and build a consensus in favor of passage. In the entire discussion, I’ve seen no discussion of credible evidence of this economic harm. There’s no question in my mind that piracy exists, that people around the world are enjoying creative content without paying for it, and even that some criminals are profiting by redistributing it. But is there actual economic harm? In my experience at O’Reilly, the losses due to piracy are far outweighed by the benefits of the free flow of information, which makes the world richer, and develops new markets for legitimate content. Most of the people who are downloading unauthorized copies of O’Reilly books would never have paid us for them anyway; meanwhile, hundreds of thousands of others are buying content from us, many of them in countries that we were never able to do business with when our products were not available in digital form. Congress (and the White House) need to spend time thinking hard about how best to grow our economy – and that means being careful not to close off the frontier, or to harm those trying to settle it, in order to protect those who want to remain safe at home. British publishers could have come to America in the 19th century; they chose not to, and as a result, we grew our own indigenous publishing industry, which relied at first, in no small part, on pirating British and European works. If the goal is really to support jobs and the American economy, internet “protectionism” is not the way to do it. *The White House emailed me later in the morning to point out that the epetition response was posted on Saturday morning. Last month, Cory Doctorow talked with Al Gore, Vint Cerf and Tim Berners-Lee in Mexico City about privacy, freedom, neutrality and democracy in the context of the Internet and the Web. Shaky handheld video is embedded below — the audio is worth tuning in, however, even if the video is a bit jumpy. We had a wide-ranging discussion, but kept circling back to the threats and promises for the net — copyright wars, privacy wars, government and grassroots. It was a lot of fun, and quite an honor, and I’m happy to see they’ve got the video online. Cloud computing, for instance, will “survive if we change federal CIOs,” he said. “It’s here, and it’s not going away. 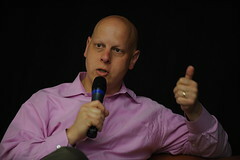 McClure describes cloud computing as a worldwide global development in both business and government, where the economics and efficiencies created are “compelling.” The move to the cloud, for instance, is behind US plans to close or consolidate some 800 data centers,, including hundreds by the end of 2011. Cloud computing was just one of five macro trends that McClure “listed at this year’s FOSE Conference in Washington, D.C. FOSE is one of the biggest annual government IT conferences. The GSA is the “engine behind the administration’s ‘cloud-first’ strategy,” said McClure, lining up the procurement details for government to adopt it. He said that he’s seen “maturity” in this area in the past 18-24 months. Two years ago, National Institute of Standards and Technology (NIST) was spending time at conferences and panels defining it. Now we have cloud deployments that are robust and scalable, said McClure, including infrastructure as a service and email-as-a-service. Government cloud deployments now includes public facing websites, storage, disaster recovery andare beginning to move into financial apps. Data.gov has “treasure troves” of data that entrepreneurs and citizens are turning into hundreds of applications and innovations, said McClure. Inside of government, he said that access to data is creating a “thirst” for data mining and business intelligence that help public servants work more efficient. As McClure noted, you have to include security at a government IT conference. The need for improved security on the Web, for critical infrastructure, on email and where ever else government has exposed attack surface is clear to all observers. For the first time, the 2011 G-8 Summit included discussion of the Internet as a top-level issue, alongside the ongoing conflict in Libya, economic growth, nuclear safety, climate change, foreign aid and national security. We discussed new issues such as the Internet which are essential to our societies, economies and growth. For citizens, the Internet is a unique information and education tool, and thus helps to promote freedom, democracy and human rights. The Internet facilitates new forms of business and promotes efficiency, competitiveness, and economic growth. Governments, the private sector, users, and other stakeholders all have a role to play in creating an environment in which the Internet can flourish in a balanced manner. In Deauville in 2011, for the first time at Leaders’ level, we agreed, in the presence of some leaders of the Internet economy, on a number of key principles, including freedom, respect for privacy and intellectual property, multi-stakeholder governance, cyber-security, and protection from crime, that underpin a strong and flourishing Internet. The “e-G8” event held in Paris on 24 and 25 May was a useful contribution to these debates. That eG8 showed that online innovation and freedom of expression still need strong defenders. Some of the concerns will be assuaged in this communique. While the body of the communique is comprised of high level principles and does not contain specific prescriptions, it does not specifically reference to international human rights laws or a “freedom to connect,” an exception that supporters of free expression like Article 19 have criticized as unsufficient. In addition, paragraph 15, below, renews a “commitment to ensuring effective action against violations of intellectual property rights in the digital arena, including action that addresses present and future infringements” that may obliquely refer to the Anti-Counterfeiting Trade Agreement, or “ACTA,” that the Electronic Frontier Foundation and others have expressed concerns about as it has moved through drafting stages. “The Internet has become the public arena for our time, a lever of economic development and an instrument for political liberty and emancipation. Freedom of opinion, expression, information, assembly and association must be safeguarded on the Internet as elsewhere. Arbitrary or indiscriminate censorship or restrictions on access to the Internet are inconsistent with States’ international obligations and are clearly unacceptable. Furthermore, they impede economic and social growth. Coming on a week when Iran vowed to unplug the Internet, disconnecting Iranian citizens from the rest of the world, holding up those principles is both timely and notable. The full section of the communique regarding the Internet follows. 4. All over the world, the Internet has become essential to our societies, economies and their growth. 5. For citizens, the Internet is a unique information and education resource and thus can be a helpful tool to promote freedom, democracy and human rights. 6. For business, the Internet has become an essential and irreplaceable tool for the conduct of commerce and development of relations with consumers. The Internet is a driver of innovation, improves efficiency, and thus contributes to growth and employment. 7. For governments, the Internet is a tool for a more efficient administration, for the provision of services to the public and businesses, and for enhancing their relations with citizens and ensuring respect for and promotion of human rights. 8. The Internet has become a major driver for the global economy, its growth and innovation. 9. The openness, transparency and freedom of the Internet have been key to its development and success. These principles, together with those of non-discrimination and fair competition, must continue to be an essential force behind its development. 10. Their implementation must be included in a broader framework: that of respect for the rule of law, human rights and fundamental freedoms, the protection of intellectual property rights, which inspire life in every democratic society for the benefit of all citizens. We strongly believe that freedom and security, transparency and respect for confidentiality, as well as the exercise of individual rights and responsibility have to be achieved simultaneously. Both the framework and principles must receive the same protection, with the same guarantees, on the Internet as everywhere else. 11. The Internet has become the public arena for our time, a lever of economic development and an instrument for political liberty and emancipation. Freedom of opinion, expression, information, assembly and association must be safeguarded on the Internet as elsewhere. Arbitrary or indiscriminate censorship or restrictions on access to the Internet are inconsistent with States’ international obligations and are clearly unacceptable. Furthermore, they impede economic and social growth. 12. The Internet and its future development, fostered by private sector initiatives and investments, require a favourable, transparent, stable and predictable environment, based on the framework and principles referred to above. In this respect, action from all governments is needed through national policies, but also through the promotion of international cooperation. 13. We commit to encourage the use of the Internet as a tool to advance human rights and democratic participation throughout the world. 14. The global digital economy has served as a powerful economic driver and engine of growth and innovation. Broadband Internet access is an essential infrastructure for participation in today’s economy. In order for our countries to benefit fully from the digital economy, we need to seize emerging opportunities, such as cloud computing, social networking and citizen publications, which are driving innovation and enabling growth in our societies. As we adopt more innovative Internet-based services, we face challenges in promoting interoperability and convergence among our public policies on issues such as the protection of personal data, net neutrality, transborder data flow, ICT security, and intellectual property. 15. With regard to the protection of intellectual property, in particular copyright, trademarks, trade secrets and patents, we recognize the need to have national laws and frameworks for improved enforcement. We are thus renewing our commitment to ensuring effective action against violations of intellectual property rights in the digital arena, including action that addresses present and future infringements. We recognize that the effective implementation of intellectual property rules requires suitable international cooperation of relevant stakeholders, including with the private sector. We are committed to identifying ways of facilitating greater access and openness to knowledge, education and culture, including by encouraging continued innovation in legal on line trade in goods and content, that are respectful of intellectual property rights. 16. The effective protection of personal data and individual privacy on the Internet is essential to earn users’ trust. It is a matter for all stakeholders: the users who need to be better aware of their responsibility when placing personal data on the Internet, the service providers who store and process this data, and governments and regulators who must ensure the effectiveness of this protection. We encourage the development of common approaches taking into account national legal frameworks, based on fundamental rights and that protect personal data, whilst allowing the legal transfer of data. 17. The security of networks and services on the Internet is a multi-stakeholder issue. It requires coordination between governments, regional and international organizations, the private sector, civil society and the G8’s own work in the Roma-Lyon group, to prevent, deter and punish the use of ICTs for terrorist and criminal purposes. Special attention must be paid to all forms of attacks against the integrity of infrastructure, networks and services, including attacks caused by the proliferation of malware and the activities of botnets through the Internet. In this regard, we recognize that promoting users’ awareness is of crucial importance and that enhanced international cooperation is needed in order to protect critical resources, ICTs and other related infrastructure. The fact that the Internet can potentially be used for purposes that are inconsistent with the objectives of peace and security, and may adversely affect the integrity of critical systems, remains a matter of concern. Governments have a role to play, informed by a full range of stakeholders, in helping to develop norms of behaviour and common approaches in the use of cyberspace. On all these issues, we are determined to provide the appropriate follow-up in all relevant fora. 18. We call upon all stakeholders to combat the use of Internet for trafficking in children and for their sexual exploitation. We will also work towards developing an environment in which children can safely use the Internet by improving children’s Internet literacy including risk awareness, and encouraging adequate parental controls consistent with the freedom of expression. 19. We recognize the importance of enhanced access to the Internet for developing countries. Important progress has been achieved since the Okinawa Summit and we pay tribute to the efforts made by developing countries in this regard as well as the various stakeholders, governments, the private sector and NGOs, which provide resources, expertise and innovation. We encourage initiatives, in partnership with the private sector, on the use of the Internet with a development purpose, particularly for education and healthcare. 20. As we support the multi-stakeholder model of Internet governance, we call upon all stakeholders to contribute to enhanced cooperation within and between all international fora dealing with the governance of the Internet. In this regard, flexibility and transparency have to be maintained in order to adapt to the fast pace of technological and business developments and uses. Governments have a key role to play in this model. 21. We welcome the meeting of the e-G8 Forum which took place in Paris on 24 and 25 May, on the eve of our Summit and reaffirm our commitment to the kinds of multi-stakeholder efforts that have been essential to the evolution of the Internet economy to date. The innovative format of the e-G8 Forum allowed participation of a number of stakeholders of the Internet in a discussion on fundamental goals and issues for citizens, business, and governments. Its free and fruitful debate is a contribution for all relevant fora on current and future challenges. 22. We look forward to the forthcoming opportunities to strengthen international cooperation in all these areas, including the Internet Governance Forum scheduled next September in Nairobi and other relevant UN events, the OECD High Level Meeting on “The Internet Economy: Generating Innovation and Growth” scheduled next June in Paris, the London International Cyber Conference scheduled next November, and the Avignon Conference on Copyright scheduled next November, as positive steps in taking this important issue forward.